Every so often, wonderful instruments that are destined to become classics are dreamed up, engineered, put through the paces and born into the world; our friends at Ernie Ball / Music Man have done just that. 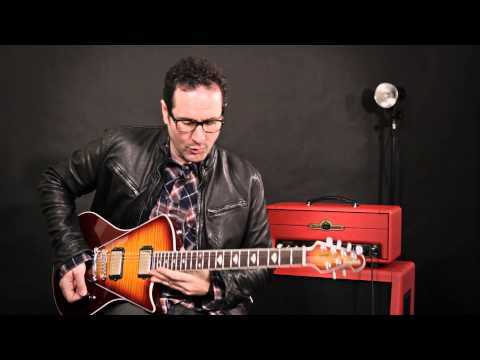 Recently, Ernie Ball / Music Man introduced the Armada electric guitar and produced a great video featuring the Armada played by the incredibly talented guitar virtuoso / producer, Blues Saraceno through our Chandler Limited GAV19T guitar amplifier. The Chandler Limited GAV19T was introduced at NAMM 2013. Also featured in the video is the "Dirty Girl" fuzz guitar pedal from Dirty Boy Pedals. When this video was presented to us, we instantly felt that these two pieces, the Armada electric guitar and GAV19T guitar amplifier were an irresistible match; the one knob Dirty Girl fuzz pedal adds another sweet layer of electrified guitar goodness. Of course Blues Saraceno's incredible phrasing and tone really brought this combination of gear to life.